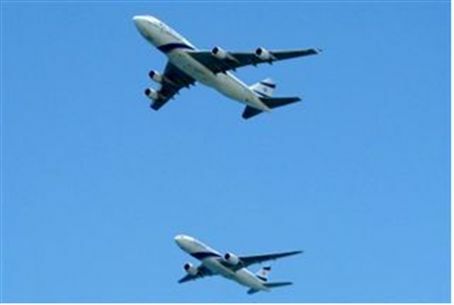 Israel's national airline has resumed flights to Cairo, according to Egyptian media. Flight 443 arrived in the Egyptian capital at 1:00 a.m. Monday, according to the Al-Masry Al-Youm daily newspaper. There were 59 passengers aboard the flight, which brought 12 passengers back to Israel's Ben Gurion International Airport within three hours. The airline has had a route to Cairo since 1980. However, flights between Cairo and Tel Aviv ceased last September after a violent mob stormed the Israeli Embassy in the Egyptian capital and tore it apart. Staff in the building barely escaped with their lives, and that only after receiving assistance from Egyptian commandos who arrived after personal intervention from U.S. President Barack Obama. Israeli Ambassador Yitzchak Levanon was evacuated from Egypt for his own safety, as was nearly all other official staff at any other Israeli facility. He eventually returned to Cairo for a quick meeting with his Egyptian counterpart to tie up loose ends, and then flew back to Israel. Levanon's successor, Yaakov Amitai presented his credentials to the head of the Supreme Council of the Armed Forces, Mohamed Hussein Tantawi, in late February. In April, Amitai quietly cleared out the embassy building six months after it had been attacked, and sent two Israeli military planes loaded with documents and equipment back to Tel Aviv. Embassy staff has discreetly returned to Israel each weekend for security reasons, according to a report last month in the Hebrew-language newspaper Yedioth Acharonot.